Hailed as “an astonishing talent, with exquisite technique”, Nigel Armstrong was born in Sonoma, California, where he began playing the violin at the age of five. Nigel made his orchestra debut in 2002 as a soloist with the Baroque Sinfonia and has since performed concertos with the symphony orchestras in Dusseldorf, Oslo, Boston, San Francisco, Los Angeles, Philadelphia and Buenos Aires, among others. He served as concertmaster for the American Youth Symphony and the Colburn Orchestra when he was a student in Los Angeles. As a soloist, Nigel remains a personal favourite of Sir Neville Marriner, who looks forward to his next performances with Nigel. After recording the Korngold concerto on this album, Sir Neville and Nigel gave three more performances of the work with orchestras in Europe. Nigel won the Premio Tango prize at the first international violin competition in Buenos Aires, and the Ole Bull and Nordheim awards in Oslo. 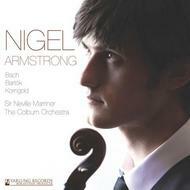 Nigel also took first place in the Boston Symphony Orchestra concerto competition. In Moscow in 2011, Nigel won Best Performance of the Commissioned Work by John Corigliano with Stomp and was the only American finalist in the Tchaikovsky International Violin Competition.